This article starts off with some bad news for people wanting to see how a historic bridge is being restored. The annual Iron and Steel Preservation Conference, which takes place in March at the Lansing Community College in Lansing, Michigan has been cancelled for this year, due to unforseen circumstances that were beyond the control of the event organizers. The 2015 conference is in the works and more information will come when it becomes available. And while the conference features workshops on how to rivet, straighten metal and perform other tasks related to restoring a historic bridge, people interested in seeing this live have a grand opportunity to do so- in Iowa! Specifically, at the Bunker Mill Bridge, located over the English River southeast of Kalona. The demonstration on how to hot-rivet truss parts together and restore portions of the bridge is scheduled to take place February 18th, beginning at 10:00am at Max Cast at B Avenue in Kalona. Work will then proceed at the bridge site, with Nels Raynor of BACH Steel leading the demonstrations. There’s no admission to attend the event, and lunch will be available at the Chamber of Commerce with a free-will donation open for those willing to donate money for the project. Cast iron flowers made using removed steel railings will be made for sale at a first come, first served basis. The Bunker Mill Bridge, a Pratt through truss bridge that was built in 1887 by the King Bridge Company and modified in 1909 by the Iowa Bridge company, has been literally rising from the ashes, bit by bit. Once considered dead by and condemned by the county after a raging fire this past August, which destroyed the entire bridge decking, the Friends of the Bunker Mill Bridge, in cooperation with the Grinnell-based Workin Bridges Company and BACH Steel (based in Michigan), have been raising funds for Phase I of the project. There, the main span was jacked up to allow for repairs on the southern abutment and its shoe portion which holds the truss bridge’s end posts and stringers in tact. At the same time, many truss parts, including the stringers, will be repaired or replaced, some of which will be done with this workshop on the 18th. The work will be completed in the spring with the addition of new planking, much of which will have been bought by donors whose names will be on there. Phase II of the project will feature the replacement of the sloping northern approach span (as seen in the very top picture) and the bridge railings with that resembling ornamental features that were typical of truss bridges during their hey day in the 1880s and 1890s. A plaque with all the donors will be incorporated into the railings, and a park will be added. This will be done, once phase 1 is completed. Your help is needed for the completion of Phase I. $20,000 is needed to complete the task. Apart from purchasing bridge memorabilia, the group has offered customized bridge planks at $100 per donor, $400 per set. You can also purchase a stringer for $450, or a C-clip for $10. 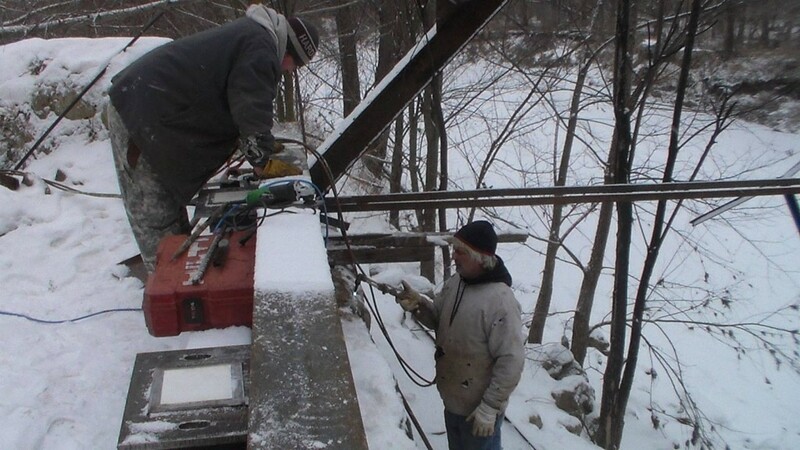 The stringers for the bridge is used to support the bridge decking (the planks), with the C-clips holding them together. According to Bowers, 1700 of these clips are needed. More information on how to purchase them can be found here. The Bunker Mill Bridge project has brought together bridge experts and many who have no background knowledge of bridge preservation but have an interest either in this profession, saving the bridge, the county history, or all of the above. It is hoped that once the restoration of the bridge is completed, that it becomes not only another example of how a bridge made of metal can be restored for generations to come, but one which involved people from all aspects, seeing how a bridge can be built and rebuilt, learning new things that can be used for their own purposes, including restoring their own bridges, which are enough to go around.